I like to spend a little time on Pinterest at the end of a long day and saw a simple but clean card by Ruth M over at Flower Sparkle that really jumped out at me because it uses one of my new favorites called "Madison Avenue". One of the reasons it's one of my favorites is because I didn't need to purchase it. It was FREE for M.E. and it can be FREE for you too! It is a Sale-A-Bration set. 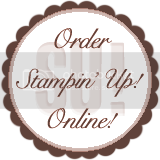 Sale-A-Bration is where when you purchase $50 in Stampin' Up! merchandise you get to pick one item from the Sale-A-Bration brochure. Order $100 pick two and so forth. I guess until you get them ALL! This is the card I made. The original can be found on my pinterest papercrafting board here. Make sure you follow me on Pinterest to see what I've been pinning today. Go ahead and place your order today and earn this set for FREE! Click here to order.